This description is for the Dinner Package Only! Regular admission tickets include admission only! 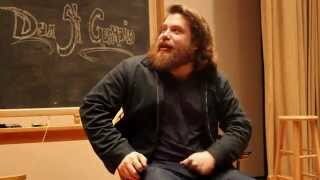 Celebrate Valentine's Day at the Funny Bone with comedian Dan St. Germain! Price is $40 per person. Customers with the dinner package will have preferred seating. Bar opens at 6:30pm and Seating is at 7:00. Show starts at 8:00pm. Dan St Germain was chosen as a featured comic in Variety's “10 Comics To Watch” list, was listed as one of Paste Magazine's Top 10 Great Underrated Comedians, named Time Out NY's "Comedy Break Out" of 2013, selected as one of Mandatory.com's "Comedians to Watch Out For" in 2014, and he's currently developing a show with FOX. He's got a Half Hour special on Comedy Central and has appeared on Jimmy Fallon, Conan, Best Week Ever, @Midnight, We Love the 2000s, John Oliver's New York Stand-Up Show, The Electric Company, Guy Code, and Friends of the People. He's the creator and star of the web series Kicking Dan Out, was featured on My Damn Channel, In Security on Comedy Central Studios, and has collaborated with Above Average. Dan's been a guest on WTF with Marc Maron, Carolla, You Made it Weird, Ron and Fez, Bob and Tom, Fitzdog Radio, and The Artie Lange Show. He's starred in a Super Bowl commercial with Howard Stern, Jack Link's promos for Comedy Central, and was selected by Time Out New York as having one of the best jokes about New York City, on a list that included Woody Allen. Check out My Dumb Friends, his podcast on the All Things Comedy Network and his album Bad at the Good Times on AST Records, both of which were listed by Paste Magazine as among the best podcasts and albums of 2014. This winter he'll be hosting The Joke on HLN and appearing on New Girl.